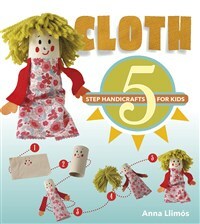 Guaranteed to spark children's imagination, this book shows how easy it is to make a wide range of whimsical cloth objects using commonly available fabrics such as wool, felt, burlap, and cleaning cloths. In five easy steps, kids will have fun crafting everything from a three-dimensional dog, to a marionette, pompom keychain, and textile collage. These experiments in color, texture, and shape will provide hours of hands-on entertainment. Anna Llimós graduated from the Fine Arts University of Barcelona. She has a master's degree in teaching and drawing and a master of humanities degree specializing in contemporary art, literature, and culture. Her work has also been shown at exhibits. This book is part of a series of books she has authored on handicrafts for kids.